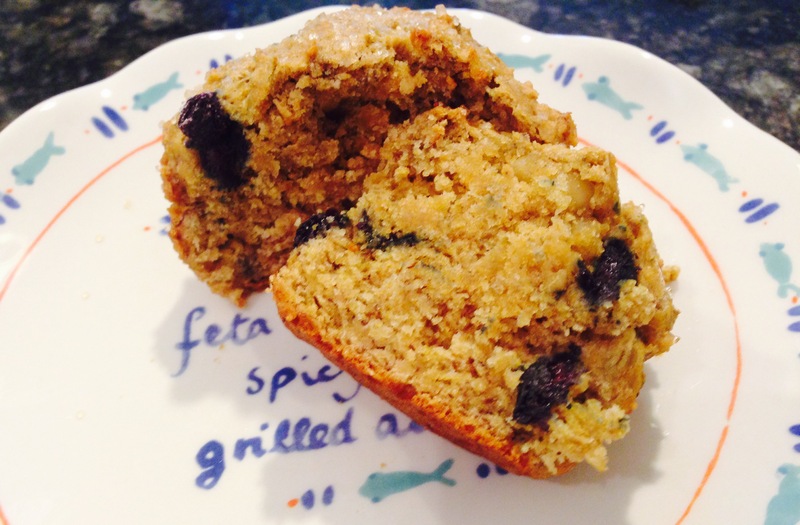 Vegan Banana-Blueberry Muffins – One Half Indian. I wanted to make something for my father-in-law for Father’s Day, but he has some diet restrictions, plus, Ma does not eat eggs. So, if I wanted to make something that they both could eat, then it needed to be healthy and eggless. The basic recipe I used came from Dassana Amit on Veg Recipes of India. 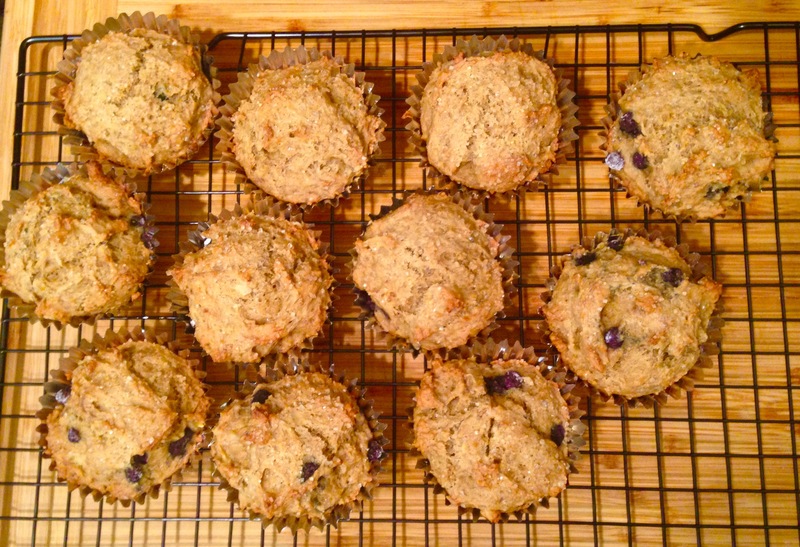 I added blueberries and walnuts to give the muffins some extra flavor. If I was making these for myself, I would also add one or two tablespoons more of sugar. These are pretty great for a healthy muffin though. The texture is lovely with a nice subtle banana flavor coming through. 1. Line a muffin tin with muffin cups and preheat the oven to 350 degrees. 2. In a bowl, take the chopped bananas and sugar and mash together with a fork or masher. I used an oversized serving fork and it worked great. Mash until smooth. If a few chunks of bananas remain, that’s okay. 3. Add the oil and butter to the bowl. Mix well with a whisk to be sure that the oil is incorporated completely. 4. Add vanilla and lemon juice. Mix well. 5. Sieve the whole wheat flour/atta, baking soda, baking powder, and salt into a bowl. You could do this directly into the wet ingredients bowl if you want. 6. Add sieved dry ingredients to wet ingredients. Fold the dry ingredients gently into the wet ingredients. Don’t overdo the folding. When you are close to being done folding the ingredients, add the chopped walnuts. You could also add the blueberries here, but I added them to each individual cup to help avoid breaking the blueberries. 7. Fill 10 baking cups 1/3 full with batter. Add in a few floured blueberries to each cup on top of the batter. Fill each cup the rest of the way with batter so that each cup is about 3/4 full. Sprinkle the top of each muffin cup with some raw sugar. 8. Place muffins in the preheated oven and bake for about 20 minutes or until a toothpick inserted in the middle comes out clean. 9. Allow to cool and then enjoy! These go great with a glass of milk or coffee or tea.